The ICA London’s Upper Gallery is currently presenting the exhibition ‘Fact & Trouble’ by American artist Martine Syms, exploring the space between lived experience and its representation in everyday life, and contemporary media. The artist presents her latest video series ‘Lessons’ – an ongoing project – which the gallery describes as a long, incomplete poem in 180 sections. Syms, a Los Angeles-based artist employs historiography, semiotics, and Pop imagery, the artist explores how language and physical gestures are expressions of identity manipulated by the media, via video snippets; each ‘Lesson’ takes the form of a 30-second appropriated TV clip. The artist is the founder of Dominica, a publishing imprint created by Syms to explore black aesthetics in visual culture. Image: Martine Syms, Fact & Trouble, installation view, ICA, 2016. Photo: P A Black © 2016. Like a collection of distilled memories, Syms’ Pop collages climb the walls of the gallery like a teenager’s poster choices gone mad. Often representations of black women in popular culture; these images are part of the artist’s work, ‘Misdirected Kiss’, 2016, a random tapestry of moments, in which there appears to be no overt narrative choices in the order of the images, which instead seem ordered as an aesthetic response, mirroring the concerns of contemporary media that they reflect. In the adjacent rooms two screens mounted back to back show a looping series of clips taken from the artist’s ongoing project. 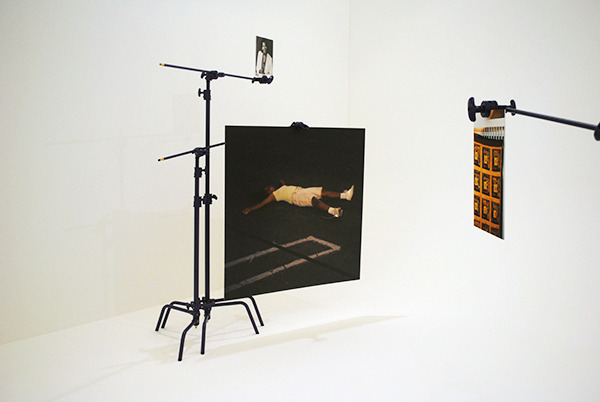 Syms displays snippets of what the artist describes as ‘orphaned media’, lost or discarded images of everyday life, randomly playing out as signifiers of American identity, or at least a filtered media-prescribed version, mimicked by Facebook and home videos. The words ‘Lightly, Slightly, Politely’, are painted in large black letters on the three walls that surround the screens, of inherited images, inherited identities – television shows, animated GIFs, police camera footage, advertisements, CCTV footage, Vine videos and various digital formats which proliferate exponentially on social media and commercial media outlets – as we sell ourselves the image of ourselves, our identities rendered in primary colours. 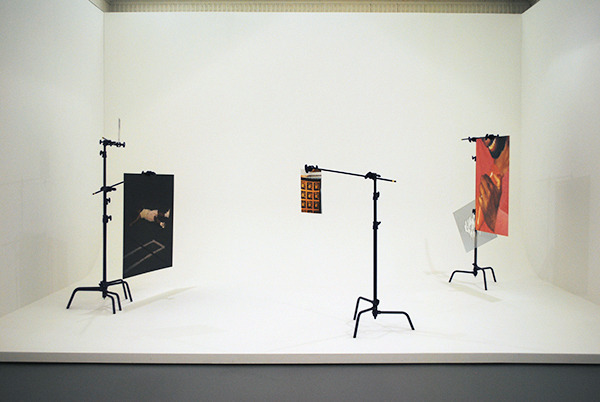 Juxtaposed with the ongoing video work, the artist has created an installation of double-sided photographs and ‘cookies’; these forms are mounted on century stands, devices often employed in film production. Syms mixes appropriated images with original, and even stills taken by the artist’s father – adding the filter of familial perception that mirrors a media ‘product’ of identity. Unburdened by complex narratives the artist’s work presents us with our own identities filtered through the lense of media intervention, it is in fact the way that we now present our own image to ourselves.